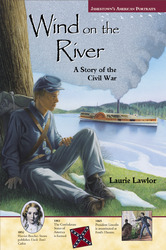 Wind on the River reveals the coming-of-age experience of 15-year-old Private John Griffith Allen, a Confederate soldier from South Carolina. Griff survives the Battle of Gettysburg in 1863 only to be captured by Yankee soldiers and sent as a prisoner of war to the notorious death trap called Point Lookout. After taking the oath of allegiance, switching sides and becoming a "Galvanized Yankee," Griff is sent to remote Fort Rice on the upper Missouri River in Dakota Territory. There he struggles to discover who he is while surviving the rigors of a hostile new environment and a terrifying Indian war. His encounter with two half-sisters living at Fort Rice challenges his prejudices and forces him to reconsider what it means to be a hero.